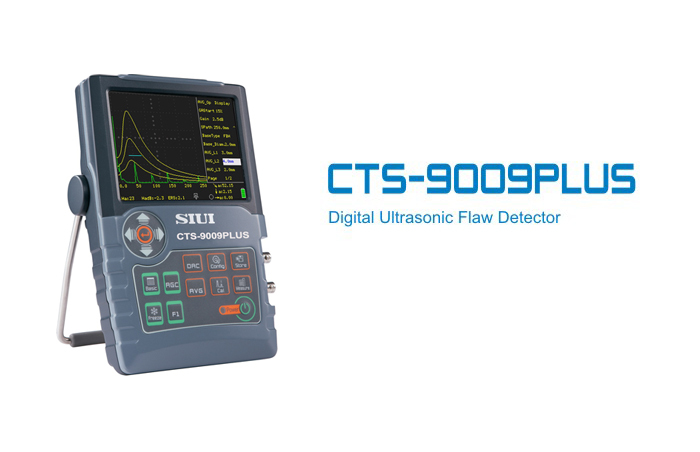 The CTS-9009PLUS is a digital ultrasonic flaw detector. The device can obtain an accurate flaw detection with its spike and square wave pulser. The device consist of different features that functions well like auto gain control, peak memory, DAC, AVG/DGS, probe frequency measurement, cineloop, curved surface correction, AWS, API and USB, Ethernet and VGA connectors. The system is protected by IP65 which is suited for complex industrial flaw detection. The device uses a Li-polymer battery which can work for 7 hours. The device can be operated easily using one hand thanks to its concisely defined keys. The weight of the unit is 1.25 kg mostly suited for aloft and field works. Operating frequency range: 0.5~20MHz, highlighting advantages of high sensitivity and broadband. Adjustable pulse width square wave transmission is up to 500V. 20 ~ 2000Hz PRF with 10 steps adjustable: avoid reverberation signals during flaw detection. The convenient and useful probe spectrum analysis function enables the users to know the probe waveform, spectrum and center frequency,resulting in more precise flaw detection evaluation. Measure crack height by edge peak echo method. Max. sampling rate 240MHz; Measurement resolution 0.1mm. RF (Radio Frequency) echo display: good to thin-wall material measurement,academic research or qualitative analysis. The DAC curve works with echo compare function, making echo quantification of different distances and amplitudes more convenient. The AGC (auto gain control) function, together with peak echo and image freeze function, help quickly identify the flaw highest echo, enabling efficient flaw detection. Advanced thickness measurement function available. Featured with AWS D1.1/D1.5 and API 5UE evaluation standards. The gate magnifier function magnifies the echo area within the gate to the whole screen display. Up to 500 sets of curve and waveform can be saved for various workpieces and flaw detection standards. Compact & Portable: The whole unit weight (battery included) is approx. 1.2kg, suitable for aloft and field work. Easy to Use: There are just a few concisely-defined keys,easy to be operated with only one hand. Ethernet communication: Achieving real-time communication with a PC and remote control. The convenient and useful probe echo frequency measure function enables the users to know the probe center frequency quickly,resulting in more precise flaw detection evaluation. Operating frequency range: 0.5~15MHz, highlighting advantages of high sensitivity and broadband. 20 ~2000Hz PRF with 10 steps adjustable: avoid reverberation signals during flaw detection. The AGC (auto gain control) function, together with peak echo and image freeze function, help quickly identify the flaw highest echo,enabling efficient flaw detection. Three different color schemes can meet the requirements of different application environments and habits. Support up to 11 kinds of language. 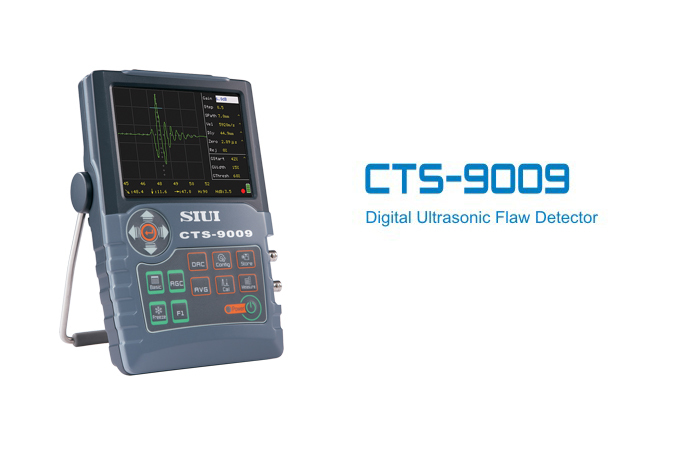 The latest ultrasonic thickness gauge CTS-49 and CTS-59 are newly released by SIUI. 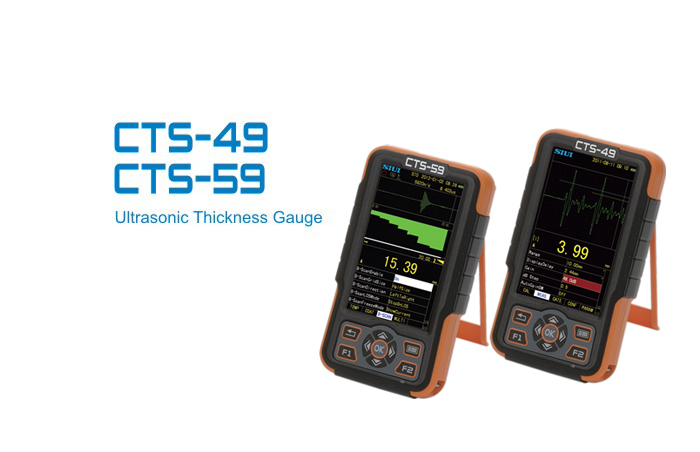 To keep pace with the leading technology and the market requirements, CTS-49 and CTS-59 are the highend thickness gauge models which combine the latest techniques, i novative design and complete inspection requirements. It is suitable for a wide range of applications, especially corrosion application. Compatible with different kinds of probes. Compact size and weighs only 0.6kg including battery. 5” high resolution color TFT-LCD monitor with high-brightness LED backlight (visible under sunshine ),800×480 pixels. Auto search function can automatically adjust display delay, display range, gain and measurement gate based on the detected echo. One-point, Two-points and Fast Zero point calibrations available. which can reduce display measurement data error.